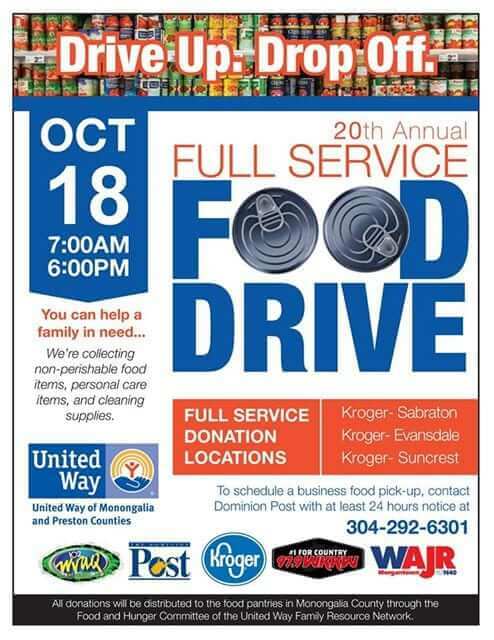 United Way of Monongalia and Preston Counties is hosting it’s 20th Annual Full Service Food drive on October 18th, 7am-6pm at all Morgantown Kroger Locations. Donations of healthy food staples are requested. These include: peanut butter, soups, stews, canned meat, beans, vegetables and fruit. Donations must be non-perishable items. Home canned foods cannot be accepted. Cleaning supplies and personal care items are also requested and appreciated. For example, toilet paper, laundry detergent and other household cleaners, dishwashing liquid, trash bags, soap, tooth paste and tooth brushes, shampoo, deodorant, razors, shaving cream, feminine hygiene products, and diapers. Monetary Donations of cash and checks are also appreciated. Please make check donations out to Monongalia County Food Pantries. If you would like more information about the Food Pantries in Monongalia County or other resources available in our county please contact Beth Elyard, United Way Family Resource Network Manager of Monongalia County at frn@unitedwaympc at 304-296-7525 or the United Way Website at www.unitedwaympc.org.